Justin Faulk #27 of the Carolina Hurricanes and Eric Fehr #16 of the Washington Capitals go after the puck during the third period of the Hurricanes 3-2 win at Verizon Center on October 10, 2013 in Washington, DC. Nathan Gerbe scored the tiebreaking goal at 6:59 of the third period, Anton Khudobin stopped 30 shots and the Carolina Hurricanes beat the Washington Capitals 3-2 Thursday night. Elias Lindholm and former Capital Alexander Semin also scored for the Hurricanes, now 25-2-4 over the past nine seasons against Washington when scoring at least three goals. Jason Chimera and Alex Ovechkin had goals for the Capitals, who took four of five from Carolina last season. Ovechkin has seven points (five goals, two assists), the most he's had after four games since 2010. Washington had a power play over the final 26 seconds and pulled goaltender Braden Holtby, but Khudobin withstood the late charge. The Capitals went 0 for 5 with the extra man after converting six of 12 power-play opportunities during their first three games. After twice making up one-goal deficits, the Hurricanes took their first lead in the third period. Holtby stopped a pair of shots before Gerbe stuffed in the second rebound from the right side of the net. 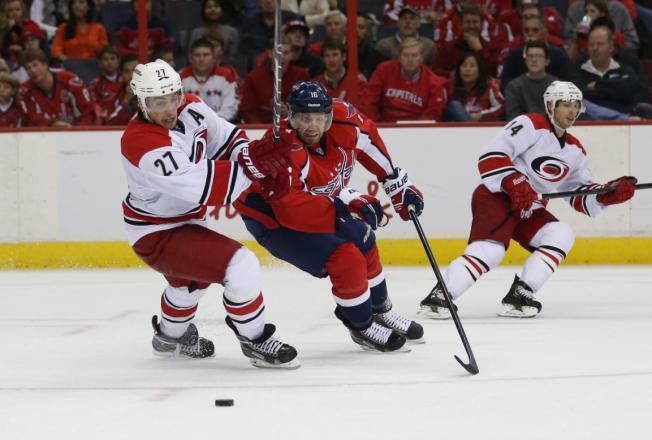 Signed as a free agent in July, Gerbe leads the Hurricanes with three goals. Chimera gave the Capitals a 1-0 lead with his first goal of the season at 5:33 of the opening period. Eric Fehr dumped the puck into the Carolina zone, Khudobin knocked it to the left circle and Chimera fired it back between the goaltender's legs. Lindholm tied it at 12:58 of the second period with a shot that glanced off the stick of Washington defenseman John Carlson. Less than a minute later, Ovechkin put Washington back in front by deflecting a shot by Steve Olesky into the net. Semin's first goal of the season, a blast from the top of the left circle with Carolina on the power play, made it 2-all. NOTES: It was the opener of a five-game homestand for the Capitals, their longest of the season. ... The Hurricanes have played 1,200 games since moving from Hartford. They've won 536 of them. ... D Alexander Urbom made his Capitals debut. He was claimed off waivers from New Jersey last week. ... Sixteen of the past 26 meetings between the teams have been decided by one goal. Washington is 11-1-4 in those games.